Its nice to have a packaging for product which can secure the product in best possible way and buyer can also view the product without opening the packaging. Custom made window boxes are made with a die-cut window on the front or on the top for product preview which helps a lot to buyer in decision making. Window boxes are made in different types and styles. Most common window boxes are tuck flap boxes with rectangular window cutout at the front panel. The cutout window can be covered with plastic cellophane. Below are few of the types of window boxes those can be used for different products. Apparel boxes are used to package shits, tie or any other clothing items. These boxes are usually made in 2-piece box style. The top lid has the window to help view the item inside without opening the box. Window can be of full size of the lid or it can cover up to 70% of the surface. Clear or frosted plastic sheet is used to cover the cutout on the lid. For all bakery items, Custom window boxes are used. Cake boxes have window on the top hinged flap. Pie boxes can be of rectangular shape or they can be of custom shape along with window. These custom made window boxes can carry all kinds of bakery items. 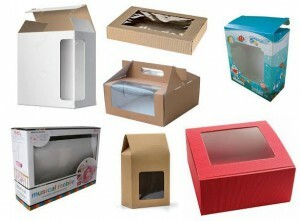 Almost all toy manufacturers use window boxes for the packaging of their product. Custom made window boxes are necessary for toy packaging because of its attraction and visibility of the toy product from outside. Toy boxes can be of two piece style or tuck flap style. Most common are the tuck flap style those have tuck in flaps at the top and bottom. Custom shape window is usually added on the front flap with clear plastic cellophane. Window boxes are also used for electronic items like head sets, computer mouse or keyboard and other electronic items. Custom window with color printing is also added for product preview. ← Suitcase Favor Box – Best Cardboard Gift Boxes for Your Party Function!